As I look at back at my running log, I have to go back all the way to November to find an entry wherein I ran in my trail running shoes. This isn’t an indication of any sort of estrangement between myself and the trails that I love so much. It’s really just a reflection of the task that lies before me – a 315 mile journey in May from the Adirondacks to Upper New York Harbor that will be primarily on paved surfaces – and thus, the need to train my legs for that very surface. But deciding to give my legs a break from the pounding of the concrete and macadam, I scheduled a long run from New York City out onto the Long Path, which as many of you know is New York State’s answer to the more famous Long Trail in the state of Vermont. 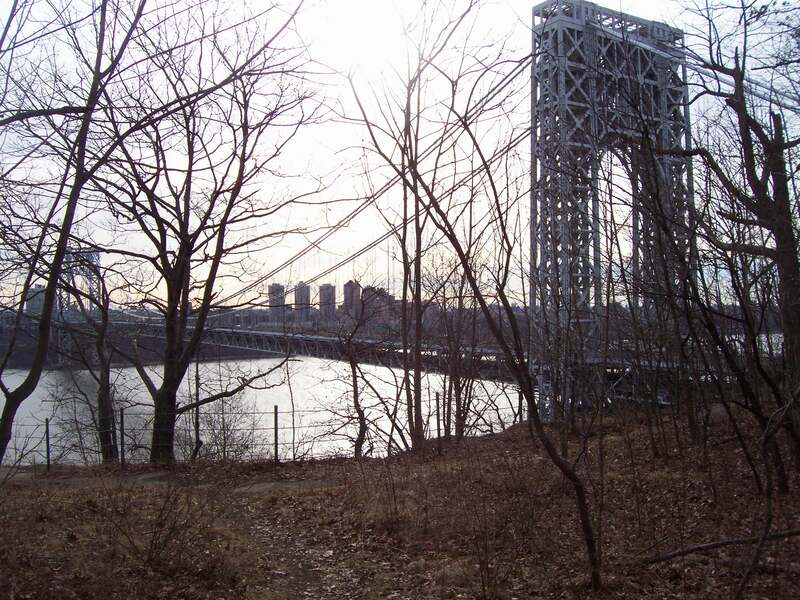 The Long Path begins/terminates on its southern end at the New Jersey side of the George Washington Bridge. From there, a runner could – if they so chose – run all the way to Thacher State Park, about 9 miles south of the state capital of Albany. 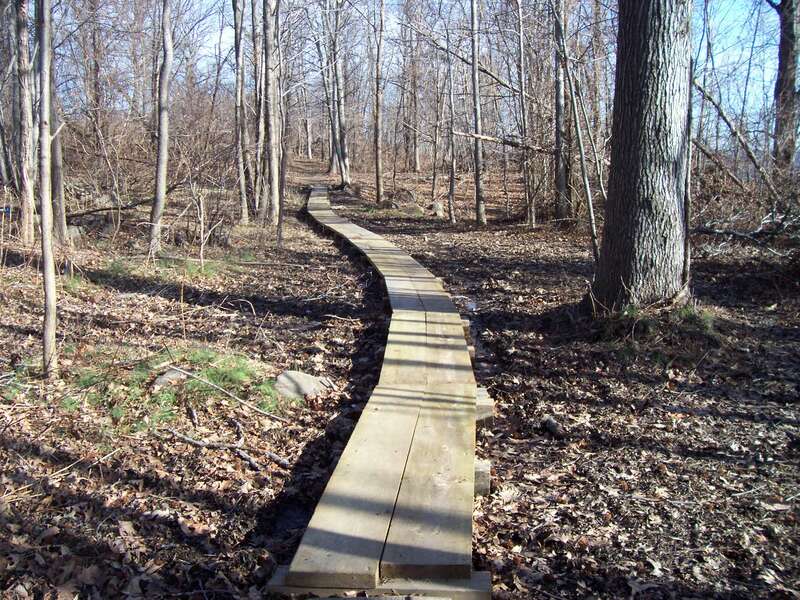 The trail twists and turns for 347 miles over some of the most difficult terrain that the Empire State has to offer, and I ran bout 25 of th ose miles myself a couple of years ago during my Harriman State Park trail project. But the section of the Long Path that begins from the G.W. 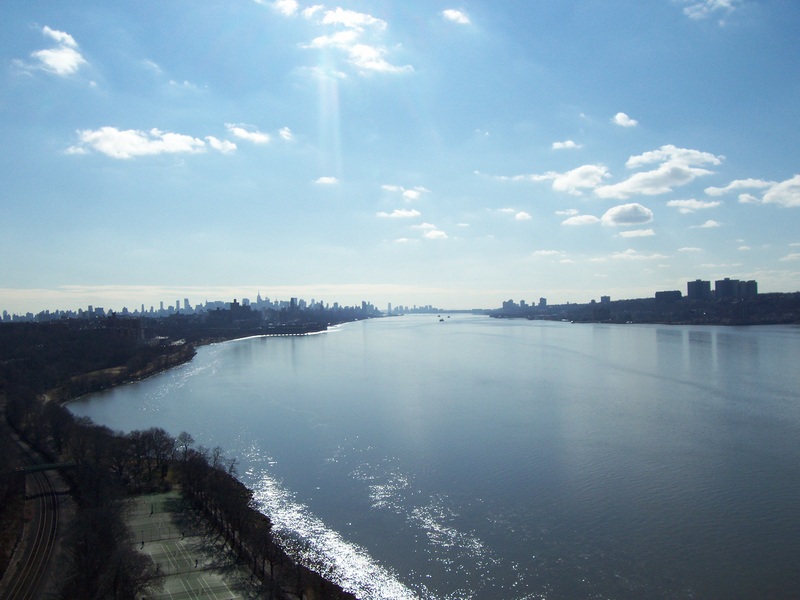 Bridge was new ground for me, and as I rode the “A” subway train north to Manhattan’s Washington Heights neighborhood, I looked forward to the run with great anticipation. 🙂 The route was an out-and-back, comprised of two primary segments. 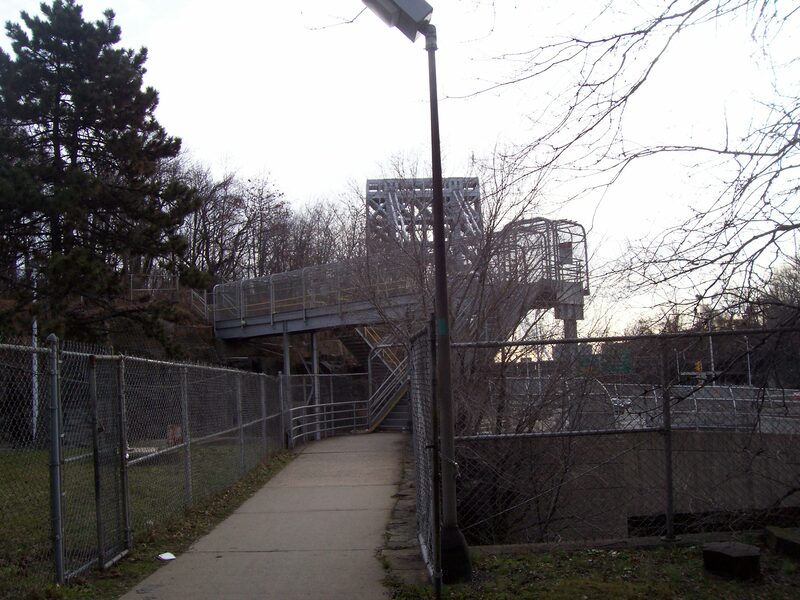 Starting from a bus station on the Manhattan side, the first task was to cross the bridge. Fortunately, there is ped path on the southern side that facilitates this. Unfortunately, the ped path doubles as a bike path, so there are swift moving obstacles to be dealt with before getting into what I will call more “quiet” territory (aka Part II of the run). Once you’re on the other side of the bridge, however, the beginning of the Long Path is right there, and quite easy to find, actually. On this particular day, I was substituting a 26-30 mile run on the city pavement for an approximately 25-mile run that would take me over the bridge, northward for about 11 miles on the trail, and then back again. The turnaround point that I’d chosen was the New York State line, as determined by a point of interest on the map referred to as State Line Lookout. As I started out on the bridge, the wind whipped, and I will confess to being just a bit uncomfortable. But I knew that once on the other side and in the woods, all would be fine, for the woods would protect me from the winter winds. In almost no time, I was in Fort Lee, NJ, and quickly spotted the teal green trail blaze of the Long Path. I climbed a set of stairs, passed through what I affectionately dubbed ‘the cage’, and was on my way. The trail segment (which comprised all but about 2 of today’s miles) was not as flat as I thought it would be. Except for a half a dozen or so brief technical spots, the trail was runnable, but there were unexpected undulations along the top side of the breathtaking New Jersey Palisade cliffs. 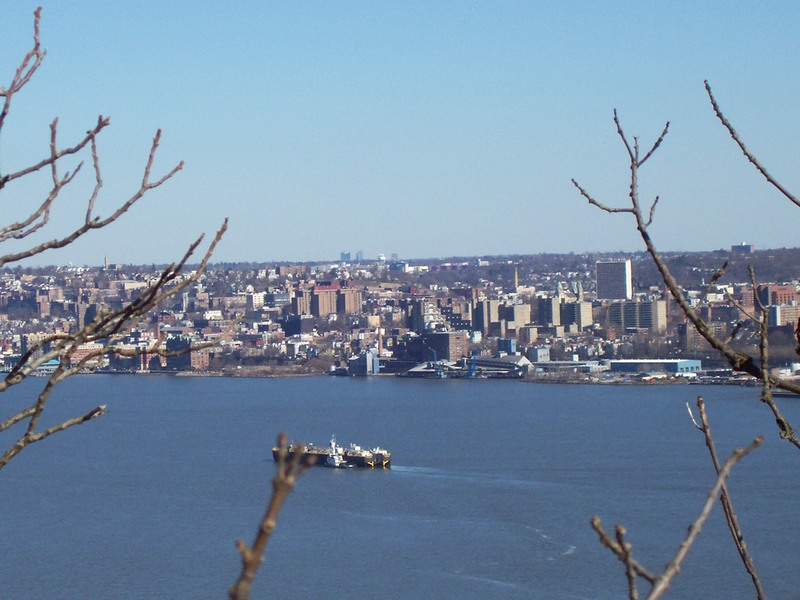 But almost from the get-go, the views of the Hudson River (and New York City on the far shore) were spectacular. The cliffs here rise more than 300 feet above the the river, making for a wonderful bird’s eye view, but also certain death should you end up going for a tumble off the edge! As I traversed further north toward the New York State line, I was treated to views of Spuyten Duyvil creek, the North Bronx, the city of Yonkers, and ultimately, the small town of Hastings-on-Hudson, where views of the Palisade cliffs that I was running on are quite spectacular in their own right. Along the way, I passed a mammoth building belonging to St. Peter’s College, and then in succession, two scenic viewpoints for motorists, both which were rest stops alongside the Palisades Interstate Parkway. 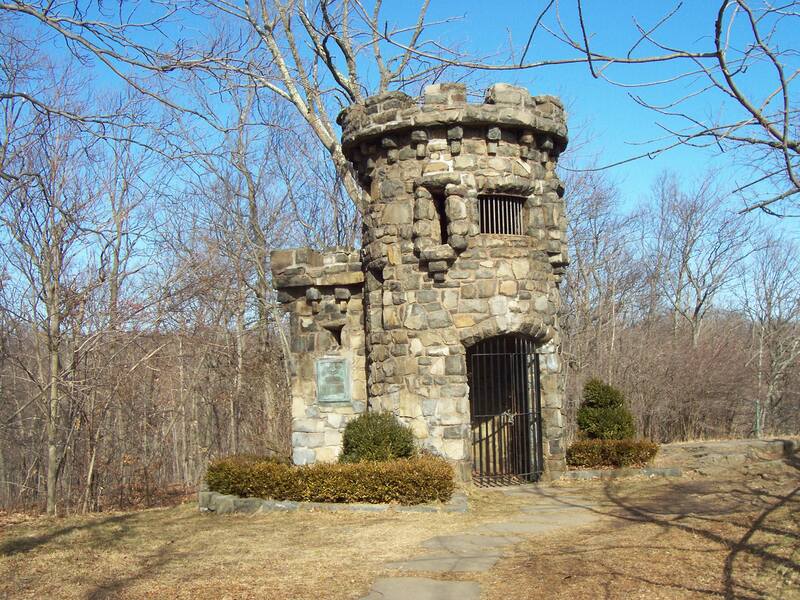 Further north, I passed Palisades Interstate Park Commission headquarters, and then 2 miles later a small, castle-like stone structure (which looked like the rook of a chess set) designated as the Women’s Federation Monument. By the time I reached the monument, I was starting to feel fatigued. I knew I wasn’t at the state line yet, but unsure of how much farther I had to go to get there, I decided that I was close enough, and turned around and headed back toward the mighty George Washington Bridge. On another day, I would make the push all the way to the state line, which as I discovered later, is approximately 1.3 miles further, and marked by a special monument as well. The return trip was a fairly easy ride back over the same route that I had just run, and because I spent less time stopping to take pictures, went about 10 minutes faster than the the “out” portion of the run. Passing all of the now familiar landmarks, the running seemed easier, and although I was getting tired, I found myself in a much more relaxed state. 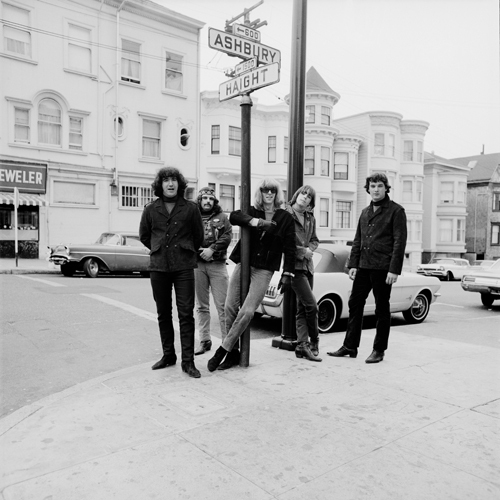 And before I knew it, I was staring at George again in its mid-afternoon majesty, its western riser looking like a beacon in the shining sun. As I neared the end of the trail and the streets of Fort Lee, the bridge appeared from a different angle, as if turning to greet me and welcome me aboard. And with nothing but a simple run of the bridge’s span left to my finish line for the day, I basked in the glorious views of the Manhattan skyline, looking forward to when I could do this run again. This entry was posted in Trail Running and tagged Englewood Cliffs, George Washington Bridge, Hudson River, Long Path, New Jersey Palisades, New York City, Palisades Interstate Park Commission, trail running, Women's Federation Monument. Bookmark the permalink. Wow! That sounds like quite a run. I can’t manage to keep up with running to handle something like that. I like to do loops so I have different views throughout. 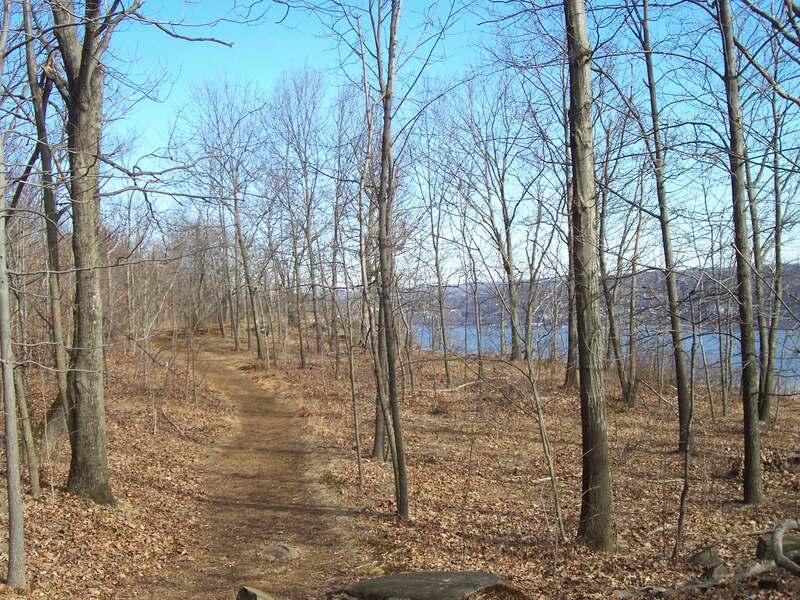 Shore Trail is very good for running at least between Fort Lee and Englewood Cliffs. I haven’t been on Shore between Englewood Cliffs and the Alpine Boat Basin. North of Alpine Shore is very rocky and many sections are impossible to run on. Think of the worst cobble stone road imaginable without any mortar to hold the rocks together. It’s been about 4 months since I’ve gone running but reading this post inspired me to get back in gear. Since my last comment here I’ve been out almost every day taking short runs trying to work up my endurance. I only started running last year and nowhere near the distances you do. A few years ago I tried to start running but quickly gave it up after getting winded halfway down the block (if that). 😦 Decided to take things a bit slower. I don’t remember ever having an urge to run but something strange happened during one of my hikes in PIP last year. I started running for different stretches. No idea why. About a 1/4 mile here and there along the route. Next thing I know I’m running nearly the entire Carpenter 8 hike minus the 4 ascents and descents between Long Path and Shore Trail. Hopefully in another week or two I’ll start trail running again. I miss it. Yes, it wasn’t much farther to State Line, but it included a major descent and climb, that you would have had to take twice! Looking forward to your epic run in May! Thanks, Phil. 🙂 After the fact, I had read the description of that last segment (the one I skipped) on the PIPC wesbsite, so knew there was a lot of elevation change there. So I can either say that my instincts were good that day, or I was a wimp. Ha! The walk over the bridge into Fort Lee and down to the river is one of my favorites. I have walked about 4 miles up the Long Path but you have now inspired me and I am going to have to go further…. I would recommend doing, Robert. I had such a good time, and I acutually regret not going all the way to the state line. Invest the time. It is worth it, at least in my opinion. Due to what has been described as ‘the Orange County Problem”, the L.P follows the road past where I live and so has become a part of my daily routine run. ( I am aware the alternate route and the SRT option). I like to run the section through Highland Lakes State Park, as part of any variation of a nearby trail run. Trails connect more than places, they provide connections between people.